This distance learning course has been created primarily for broadcast meteorologists seeking to satisfy their requirements for the Certified Broadcast Meteorologist Program. However, it will be useful for anyone interesting in broadening their understanding of the hydrologic environment, including basic hydrologic processes, water quality, flooding and societal responses, precipitation and its measurement, and drought. Completing the entire course will take approximately 10 to 12 hours. The goal of this course is to introduce broadcasters and other learners to many of the most critical topics related to hydrology and hydrologic forecasting, including basic hydrologic processes, water quality, flooding and societal responses, precipitation and its measurement, and drought. Know how to describe a watershed and locate the watersheds for your region. 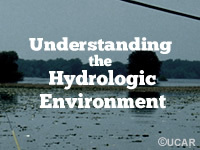 Understand the elements of the hydrologic cycle. Explain the rainfall runoff process. Describe the snowmelt runoff process. Describe precipitation estimation methods and issues. Understand flash flood guidance, taking into account the uncertainties in the product. Apply statistical methods to assess flood risk.